A few years ago I bought this wonderful Haitian metal art sculpture for my dining room. It is one of my favorite pieces of art. Besides the eye catching creative design, what makes this so interesting is that is carved by hand from a flattened recycled oil drum. Ever since then I have been on the lookout for other Haitian drum art. Story Behind the Haitian Drum Art: Founded in 1990 by a multinational group of young entrepreneurs, Caribbean Craft, formerly known as Drexcoromotes creates employment in Haiti by training unskilled - but often highly gifted - craftspeople, and by assisting the independent artisans through the introduction of new designs and new market outlets. These pieces are all made by artisans in Croix des Bouquets, Haiti. 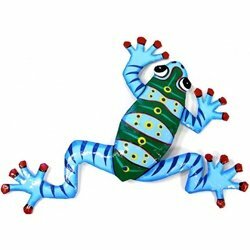 This ten inch frog is handmade in Haiti from recycled oil drums. It has a small hook to hang the piece and is painted with a bright colorful yellow design inspired by the local Hatian culture. 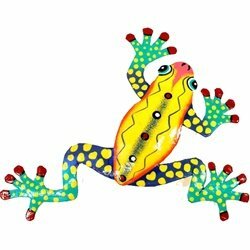 This ten inch frog is handmade in Haiti from recycled oil drums. 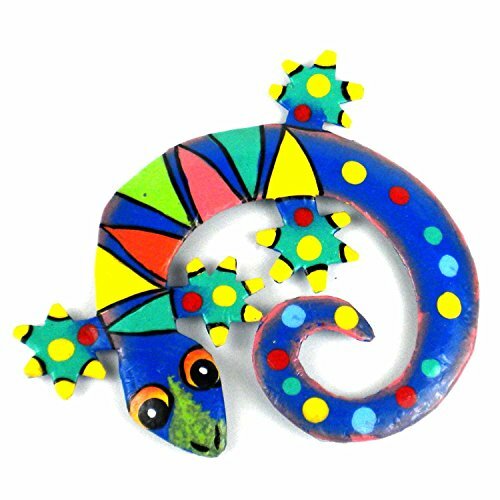 It has a small hook to hang the piece and is painted with a bright colorful blue design inspired by the local Hatian culture. 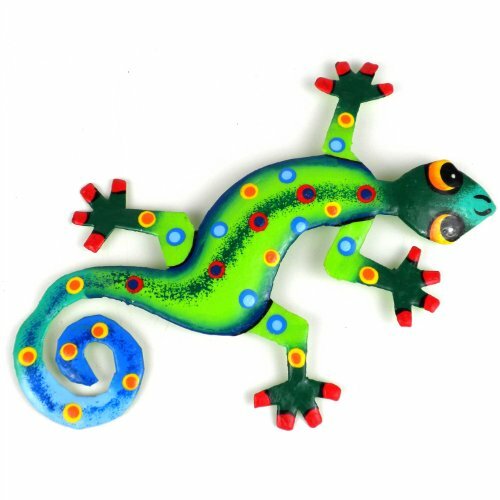 Hand-cut from steel drums by Haitian artisans, this hand-painted gecko features a unique design. It measures 6 inches tall by 6 inches wide, and has a hook on back for hanging.